Celosia argentea growing herbaceous of the genus Celosia and also known as Plumed cockscomb. 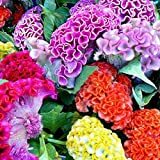 Celosia argentea annual plant and used for edible leaves and flowers but mostly used as ornamental plant, can grow in mediterranean, desert, subtropical, temperate or tropic climate and growing in hardiness zone 2+. Leaves and the flower are edible, the leaves are oval can be green, red or purple or something together. Flowers are small grow in groups on inflorescence stalk in a shape of cone, flower color can be: red, yellow, orange, pink, purple, white. 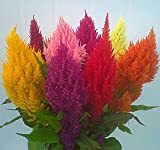 Pampas Plume (Celosia argentea plumosa) 0.25g 300-500 Seeds Variety of colors. Small flowers that grow in groups on inflorescence stalk in a shape of cone, flower color can be: red, yellow, orange, pink, purple, white. When to trim the leaves? How to trim the leaves?